After one of my more studious posts yesterday, I thought it was probably time to lighten things up. 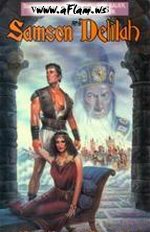 Having written about the two most well known Samson films in the last few weeks (the 1996 version, and the 1949 version), and listed all the Samson films I'm aware of, I thought I would briefly post a few comments on what is probably the next most watched version (at least by today's audiences). One strange fact about this film is that it forms a link between those two films other than the shared title and subject matter. Victor Mature, who played Samson in DeMille's 1949 version makes a cameo in the film, and it also stars Max von Sydow who would go on to narrate the 1996 version (albeit uncredited). self-respecting woman would do given half the chance, and gives him a short back and sides. For what it's worth, none of these three films show Samson with a shaved head, which seems fairly strange. Another strange choice, present in all three films but that seems to run against the bible is the design of Dagon's temple. In all three films these are open roofed, meaning no matter how much Samson pushes, it is hard to see how he could really claim quite so many lives. That said presumably this choice owes either something to Archaeological finds which suggests that roofs on this scale had not yet been developed, or it is an example of the DeMille film's pervassiveness that the other two films copy these details, possible without even realising. 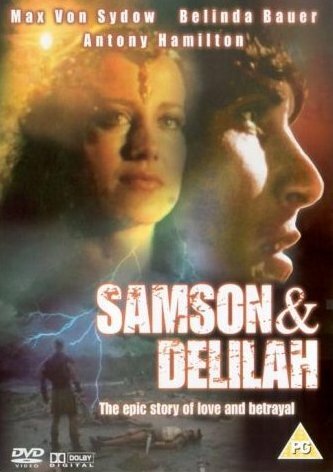 Another unusual choice which, in this case, is particular to this film is that Samson is never shown lying to Delilah about the secret of his strength, so she just catches him first time. In some ways this seems a more plausible scenario. How stupid would you have to be to actually tell your secret to someone who has already tried, three time, to zap you of your strength and hand you over to your enemies? That said, Samson does come across as the least wise character in the bible (which is up against some pretty significant competition) so it's perhaps not too surprising. So, all in all, this is not one to rush out to get hold of. There are numerous other Samson films which I have not seen but which are available from Amazon. Feel free to post any comments you have on any of them on the "Films About Samson" post.